Joe Davis, world champion snooker player many times over, was born in the mining village of Whitwell in Derbyshire on April 15th 1901, firsr child of coalminer Fred Davis and his wife Elizabeth-Ann. His father took over the Traveller's Rest pub in Whittington Moor when Joe was just 2, eigt years later moving to the Queen's Hotel which contained a full size billiard table on which the young Joe was allowed to practise. Joe Davis went to work in a billiards hall at the age of 14, earning enough money from informal matches against unsuspecting visitors to turn to a professional billiards career in 1919. He married Florence Stevenson at Chesterfield Methodist church in 1921 and in 1927 he entered the first ever professional world snooker championship, held in Nottingham, and won. He then won the first world billiards championship in 1928, making it a double that made him a star at the age of 27. Over the next 20 years, barring a break for the war, he won the world snooker title on each occasion and for good measure bagged 10 world or UK billiards titles on the way. The game bought him money and fame but took a toll on his personal life. He was divorced in 1940, remarried to a June Malo in 1945, lived in London and did a considerable amount of charity work. Davis retained a fondness for Derby where he had many friends and was a keen supporter of Derby County Football Club. He was at Wembley to see the Rams triumph over Charlton Athletic in 1946 and visited the dressing room before the match to deliver his own good luck message. Davis stepped down from playing in World championships after 1946 but carried on playing professional tournaments for many years, scoring in 1955, the first ever 147 maximum snooker break in an exhibition game at Leicester Square. He recieved the OBE in 1963, had a waxen image in Madame Tussauds and drove a car with the number plate CUE 1. His brother Fred Davis, became a well known television fiqure through the 'Pot Black' series which started in 1969. He was also a master in both billiards and snooker, himself winning the world snooker championship 8 times, carrying the game into the modern era. 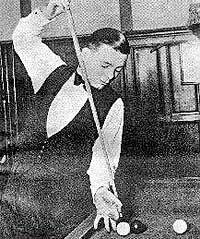 Joe Davis died in 1978 at the age of 77, one of snooker's greatest legends. His autobiography was called 'The Breaks came My Way'.